Many of us at NETWORK were intrigued by The Spirit Level – Why Greater Equality Makes Societies Stronger, the book that shows why a less-equal society is bad for everyone. 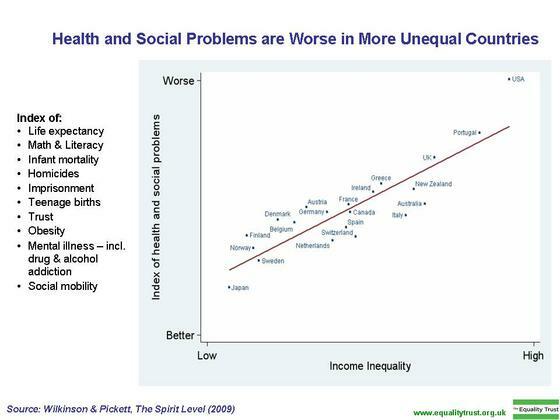 The authors – Professors Richard Wilkinson and Kate Pickett – did extensive research on various social problems in developed nations and found a correlation between a nation’s income inequality and social problems. The chart above shows that correlation. Note that the U.S. has the highest level of income inequality of all the other developed nations, and also the highest level of social problems. How is the level of trust measured? For the U.S. it’s the National Opinion Research Center’s General Social Survey question that asks people whether or not they agree that most people can be trusted. In 1960, 60 percent of respondents agreed. By 2004, this had fallen to 40%. This isn’t good. Because when people don’t trust each other they don’t cooperate with each other. This erodes ‘social capital’ which is a term used to describe people’s involvement in community life. All this sounds believable to me. What kind of community life and social relations do we envision for our country? Can we achieve it with such a high level of wealth and income inequality, and such a low level of trust? This entry was posted in Income, Mend the Gap on June 30, 2011 by networklobby.